What? I am both an extrovert and an introvert? How can that be? How can I love connecting with a broad base of wonderful people and then need to get completely alone to recharge? That just seems strange somehow…or at least I thought so. But finally understanding this was so freeing for me! All of us have probably taken some kind of assessment test over the past 10 years. Often when we take one we may externally disagree with the findings while agreeing with them internally; sometimes it’s tough to reconcile our behaviour strengths and challenges. These assessments can serve to help us have greater patience both with ourselves and others. I would have navigated my life with greater healthy margins. I would have had greater understanding of my husband and children. I would have learned to have better communication simply by having greater understanding of how different behavior style respond to information. I would have been more mindful of the situations I placed myself in and leaders I placed myself under. Different styles can just work better together! We all have so much to learn about ourselves and those we do life with ( family, friends, colleagues, etc) The great truth is that the more we understand our behaviour style the greater our success in all relationships! Have you ever taken the time to assess and consider how you are wired up? Are you a driver?~ready for new opportunities and unafraid of the challenge? Are you inspirational? ~ wanting to excite people to live and love their lives, wanting them to have fun? Are you a steady individual? ~ incredibly loyal and dying to be a part of a great team? Are you a compliant person? ~ a person who lives their lives to set standards, systems, and to have excellence in all you do? 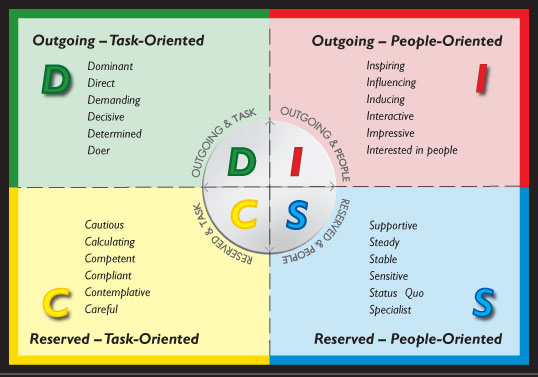 Each of these behaviour styles approaches life differently! Take the time to delve into greater understanding of why you behave the way you do and you will be amazing how you will, in return, gain greater understanding of the behavior of others! Certainly, we all have areas where we need to grow, but it is so easy to indict those whose behavioral style is different from our own. No one is wrong–just different!